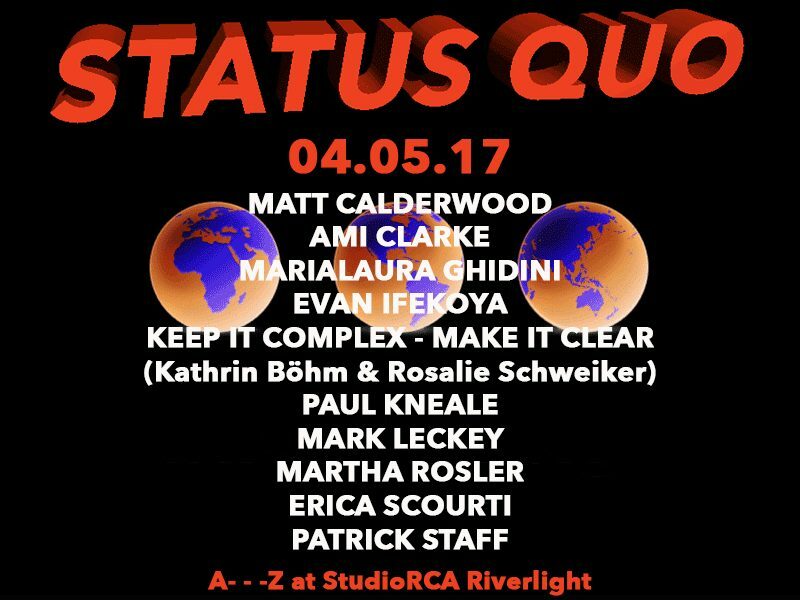 For Status Quo, eleven artists made a GIF in relation to a statement they wish to spread – by voicing an opinion or simply making a moving image. The webpage was presented as Art Licks Weekend Digital platform 2016. StudioRCA Riverlight will host showreels of the works running 24/7 in the space for a month. This project is part of A- – -Z‘s ongoing research project around the display and dissemination of artwork and adds to the morphic and viral forms of the platform. A- – -Z is an exploratory curatorial platform produced by Anne Duffau. Taking the formula of the alphabet, A- – -Z uses words related to the idea of Entropy as a starting point to map out and test various unstable potentials.